Samanvaya is an intimate luxury resort and spa set amongst the stunning panoramic rice terraces of the Sidemen valley. The Sideman Valley is quintessential Bali, offering not only magnificent views and landscapes, but also a glimpse into the traditional Balinese way of life. Our guests can enjoy our infinity swimming pool, suspended over the rice terraces, relax in our adjacent natural temperature jacuzzi, whilst still enjoying the stunning vistas, enjoy our lounge bar, dine in our restaurant, soak in the hot tub and practise yoga or meditation in our purpose built studio. We have eleven separate Villas and Lumbung’s, all of which have been built by local craftsmen using reclaimed timbers and the very best sustainable hardwoods from the forests of East Kalimantan, and together with the traditional Alang Alang straw roofs, they blend effortlessly with the surrounding gardens and rice terraces. Each villa has the luxury of its own private terrace, a great place to witness the sun rising above the hills as the valley slowly stirs to life, and as the sun sets and darkness falls, amidst the serenity of Samanvaya, the distant lights of the coastline glisten as they meet with the stars in the clear night sky. Come and immerse yourself into the local culture and lifestyle that only Samanvaya can offer. We have four luxury villas suitable for two guests. These villas enjoy stunning views across the swimming pool and beyond to the rice terraces and hills. The open air design allows a true connection with the surroundings and sounds of the Sidemen valley. Guests can enjoy the benefit of a king size bed with premium quality mattress and linens, fully stocked mini bar, tea and coffee making facilities, safe, and complimentary toiletries. You may also enjoy a selection of movies through your own television entertainment system. The attached semi open tropical bathroom has a rainwater shower, toilet, and wash basin. We have two luxury Champak villas suitable for up to three adults or two adults and one child. These larger size villas have been designed with African lodges in mind. They are beautifully appointed with luxury and privacy and have multiple seating options to enjoy the views and sounds of the surrounding gardens and Koi water ponds. They have large glass doors letting in the views of the private gardens - perfect to relax and unwind. Guests can enjoy the benefit of a king size four poster bed with premium quality mattress and linens, a fully stocked mini bar, tea and coffee making facilities, safe, and complimentary toiletries. You may also enjoy a selection of movies through your own television entertainment system. The attached semi open tropical bathroom has a rainwater shower, toilet and double wash basins. We have two Luxury Lumbung style villas suitable for up to three adults. These impressive buildings feel as if they are clinging to the rice terraces and are nestled amongst our lush tropical gardens and ponds. They are constructed from Bamboo and Alang Alang and have vaulted ceilings giving you the feeling of living in the trees. They have private terraces with stunning views across the surrounding rice terraces and landscaped gardens. Guests can enjoy the benefit of a king size bed with premium quality mattress and linens, a fully stocked mini bar, tea and coffee making facilities, safe, and complimentary toiletries. You may also enjoy a selection of movies through your own television entertainment system. The attached semi open tropical bathroom has a rainwater shower, toilet and double wash basins. This luxury villa is suitable for up to three adults, designed with couples in mind. The spacious and elegantly laid out villa has dual aspect allowing the gentle breezes awash and filter through out the villa, giving you a sense of tranquility as you spend your time with that special someone. It offers panoramic views over our Koi water ponds and surrounding vistas over rice terraces that will leave you breathless. You can enjoy a glass of wine and a sumptuous romantic dinner on your private terrace and soak up the atmosphere that is the Sideman Valley. Guests can enjoy the benefit of a king size bed with premium quality mattress and linens, a fully stocked mini bar, tea and coffee making facilities, safe, and complimentary toiletries. You may also enjoy a selection of movies through your own television entertainment system. The attached semi open tropical bathroom features a deep luxurious bath and rain shower. 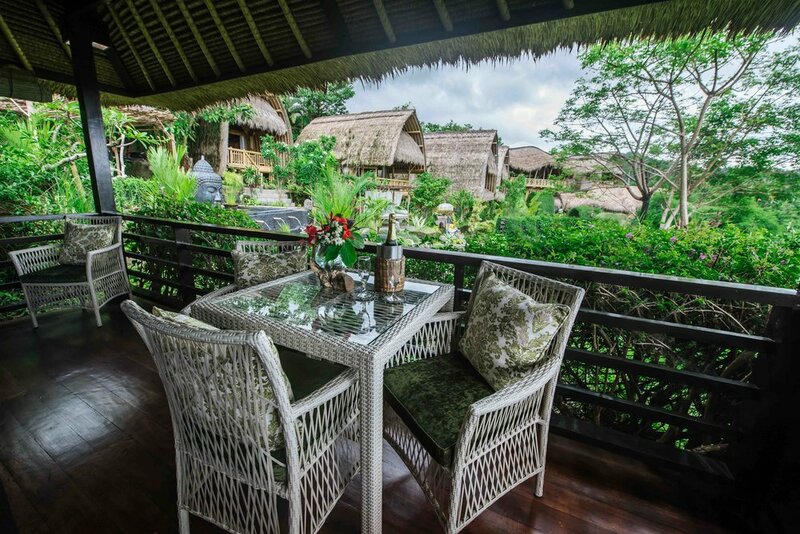 We have two luxury Lumbung style villas built over three levels. These villas are approximately 85sqm and are simply a beautiful retreat giving you room to relax, rejuvenate and soak up the peaceful surrounds. They have stunning views over the rice fields and surrounding mountains. The lower level features an air conditioned master bedroom with views out over the landscaped gardens and hot tub. The middle level features the entrance and bathroom with tiled bath, toilet, rain shower and double wash basins. An extra toilet is also on this level. The upper level features a large living area with two comfortable sofas that can be converted to single beds along with a connected spacious outside terrace with captivating views of the rice terraces and beyond, giving you a feeling of connection to the wider valley. Guests can enjoy the benefit of a king size bed with premium quality mattress and linens, a fully stocked mini bar, tea and coffee making facilities, safe, and complimentary toiletries. You may also enjoy a selection of movies through your own television entertainment system.